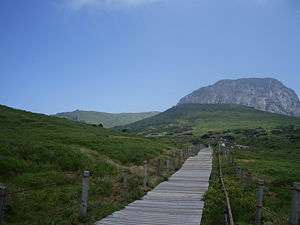 Hallasan (한라산, 漢拏山), a shield volcano on Jeju Island of South Korea, is the highest mountain in South Korea. 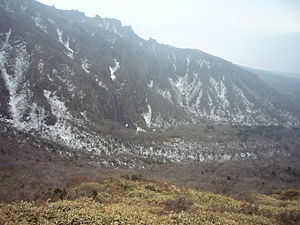 Along with Jirisan and Seoraksan, Hallasan is considered one of the three mountains of the gods of South Korea. The area around the mountain was a designated Hallasan National Park in 1970. Hallasan rises so high that it looks like it touches the Milky Way. It is sometimes called Mt. Yeongju, or Mountain of the Spirits, because it was believed that gods and spirits live on Hallasan. Alternate names for the mountain include Halla Mountain or Mount Halla and older English sources refer to the peak as Mount Auckland. In North Korea Hallasan is written in Hangul as if it were Hannasan (한나산); however, it is pronounced Hallasan. In the past, Hallasan has been known by numerous other names including Buag (부악/釜岳), Weonsan (원산/圓山), Jinsan (진산/鎭山), Seonsan (선산/仙山), Dumuag (두무악/頭無岳), Burasan (부라산/浮羅山), Yeongjusan 영주산(瀛州山), and Hyeolmangbong (혈망봉/穴望峯). Hallasan is a massive shield volcano which forms the bulk of Jeju Island and is often taken as representing the island itself. There is a local saying stating that "Jeju Island is Hallasan; and Hallasan is Jeju." The mountain can indeed be seen from all places on the island, but its peak is often covered in clouds. The mountain has been designated Korea's Natural Monument no. 182. Hallasan was created by eruptions millions of years ago during the Pliocene epoch of the Cenozoic era by a volcano that is now dormant. The island was constructed atop the continental shelf, which is presently about 100 m (300 ft) below sea level in that area. Eruptions of basalt and trachyte lava built the island above sea level, and it now reaches a height of 1,950 m (6,398 ft). A large volcanic crater tops the volcano. About 360 parasitic cones are found on the volcano's flanks, mostly cinder cones and scoria cones but also including some lava domes and about 20 tuff rings near the coast and offshore, which were formed by underwater phreatic eruptions. The most recent eruptions occurred on the flanks of the mountain in 1002 and 1007. 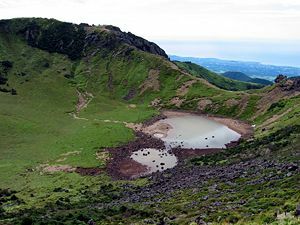 Hallasan's crater lake has been named Baengnokdam (백록담/白鹿潭), literally 'white deer lake', in accordance with a legend that benevolent wizards used to descend from heaven to ride on white deer along the shores of the lake. The size of the lake varies with the rainfall and the season, and at its largest is about is up to two kilometres in circumference with a depth up to about 100 metres. A hiking trail on Hallasan. Hallasan has a rich variety of alpine vegetation, with over 1800 species represented. In order to preserve the natural diversity, the mountain was declared Natural Monument No. 182-1 by the South Korean Government in 1966. The mountain presents a lush green face during the summer season, brilliant displays of azaleas and other flowers in the spring, rich autumn leaves in the fall and a stunning snow cap during the winter. Some of the most striking views on the mountain are the Baengnokdam Valley, Tamnagyegok Valley and Andeokgyegok Valley, as well as the Cheonjiyeon waterfall, Yongduam Cave and Manjanggul. The striking rock formations of Youngsil rival the Mangulsang formations at Kǔmgangsan on Korean's mainland. The mountain is home to Gwaneumsa, the oldest Buddhist temple on the island. The temple was originally built during the Goryeo Dynasty. Like many other temples in Korea, Gwaneumsa was destroyed and rebuilt in the twentieth century. There is a memorial site outside the temple, remembering the victims of the Jeju uprising that took place between 1948 and 1950. It is one of the most visited places of the island. The weather on Hallasan is caprecious, so it is important to bring foul-weather gear with you any time you plan to hiko on the mountain. It is also easy to become lost in the fog that frequently wraps the mountain. This makes it extra important to stay on the marked trails. Location of Hallasan on Jeju Island. There is a small fee to enter the hiking trails, and entrance is permitted from early morning until the early afternoon, and all hikers are requested to ascend and return to the bottom of the mountain before dark. ↑ Winchester, Simon. 1988. Social Climbing on Mount Halla New York Times. Retrieved December 15, 2007. Morgan, Oliver, and Jan Wiese. 2001. Volcanos. Easy reader. [Vig]: Gullhoj. This page was last modified on 27 January 2014, at 15:19.